The best thing about the most recent “Monday Madness” conversation with Scott Gunn is that I look taller than he does on the split screen video. This is quite a feat for someone who, at 5’8″ is the same size as Danny Woodhead (last football reference of the season, I promise). My boys refer to Scott as “The Tallest Priest in the Episcopal Church.” And, at 6’6″, they are likely not far removed from the truth. 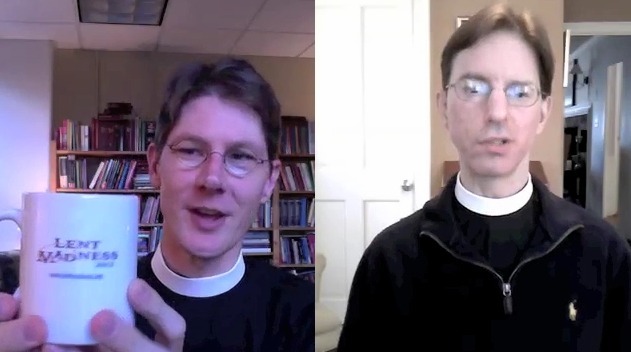 If you spend ten minutes watching the second installment of our Lent Madness buzz-building video (click here), you’ll hear us discuss some details about the 2012 bracket and, as a bonus, you’ll get a sneak peak at the newly available Lent Madness coffee mug.